No one promised every day would be a bed of roses. The next time you feel down about life, remember these six things. 1. Perfection is a pipe dream. 2. Patience is a game changer. There is no such thing as “overnight success.” Glamorized stories in books and movies might make you think otherwise, but successful people put in hours and hours of grunt work behind the scenes. They leave that part out, because it would be sad to watch somebody fail a hundred times in a row (even though most famous folks did before anybody heard of them). 3. Struggles make you stronger. Suffering gets a bad rap. It shouldn’t. How else would you develop mental strength or an ability to persevere despite adversity? Without the occasional struggle, you’d become a delicate flower who would wilt when presented with minor setbacks or challenges. Bad times provide you with enough context to appreciate good times. Sadness is the spice that gives happiness its flavor. 4. Failing isn’t really a big deal. So what if your business fails? You won’t die. Your pets, friends, and family won’t abandon you. The Earth will continue to spin. The seasons will carry on as if nothing happened. Failing isn’t a big deal to anybody or anything except your ego. Any stress or anxiety you experience related to business is 100% self-inflicted. Your mind is a really good liar. Try not to let it psych you out. Grow perspective. Everything will be okay. 5. Burying feelings isn’t helpful. Crying isn’t a sign of weakness. This is the human body’s way of releasing tension or upset feelings related to a situation. There’s nothing “macho” about concealing the way you feel. Repressing a negative feeling will cause it to grow like a cancerous tumor. You might not realize it at first, but this negativity will influence the way you do business and interact with people. The sooner you accept and deal with an emotion, the better. Remember this mantra: It is better to respond than react. Reactions are the anxious thoughts that hijack your brain when you lose a client, get stuck in traffic, misplace an item, or (insert your problem here). They do nothing to resolve the situation. They only make it seem bigger in your head. Responses are the actions you take to make things better in the here and now. They snap your mind out of the past and back into the present moment. This philosophy is simple yet profound. Applying it could change your life. Let me demonstrate how it works. If you lose a client, why worry about it? No amount of wishing will solve anything. Yes, you should make an effort to understand why they left, because then you’ll be able to do better in the future. Beyond that? Forget about it. Don’t react. Respond. You have two choices: A) Convince your ex-client they made a terrible mistake or B) Find a new client. Simple as that. 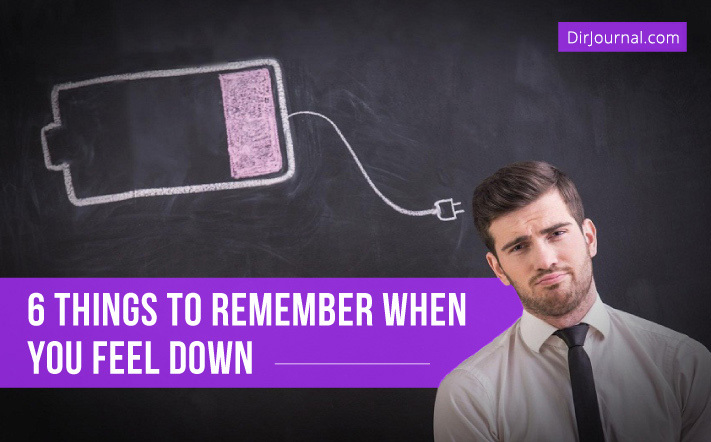 How do you boost your mood when you feel down? Tell us in the comments. Feel free to share this post with like-minded friends on Facebook and Twitter.